Brush apricots lightly with olive oil. Place on grill; cook for 1 ½ minute on each side. Transfer to a plate & cut each piece in half again; set aside. In a small bowl, blend together Beechers Honey Blank Slate cheese with spices and mix well. Refrigerate until ready to use. 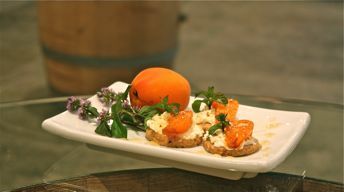 To assemble: top each shortbread with a heaping teaspoon of Beecher’s Blank Slate cheese and a piece of grilled apricot. Drizzle with honey and garnish with fresh mint and finely chopped hazelnuts. Place butter in a sauce pan over medium heat and bring to a boil. Reduce the heat and simmer for about 5 minutes or until golden brown -- do not burn. Pour butter into a metal or glass bowl and refrigerate for about 1 hour. Put butter, powdered sugar and salt in a mixing bowl; beat until smooth. Add flour and hazelnuts; mix until just blended. Add 2-3 tsp of cold water to the dough, and then shape into a ball (may need a little more water if too crumbly). Roll out dough on a lightly floured board to 1/4” thickness. Cut into rounds with a 1 ½” cookie cutter. Transfer cookies to a baking sheet; refrigerate for 30 minutes. Preheat oven to 325°F. Bake cookies for 10-12 minutes or just barely browned.